I wrote a post nearly two years ago, after NDF2011, about how the cultural heritage sector could use websites like Te Ara and NZ History to draw context for items held by collecting institutions and used in Te Ara and NZ History. More than that, they could provide links between institution’s collections, allowing users to traverse from an item held at one institution through to Te Ara’s use of that item, and on to similar items held by another institution. Adrian Kingston from Te Papa got in touch. It wouldn’t be that hard, he thought, to at least trial the idea. We’re not talking that many links are we? In some ways we are talking a lot. Te Ara uses about 30,000 media items from public and private collections up and down the country. NZ History uses maybe another 5,000. 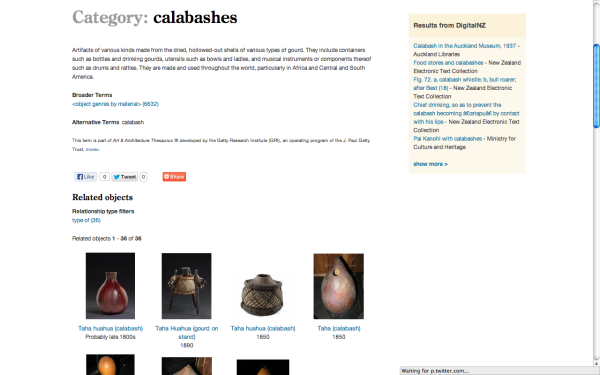 But Adrian was right; Te Ara only uses about 500 items from Te Papa’s Collections Online site. Not so many as to scare you off; not so few that you can’t judge it at the end of a trial. Once done, we’ll look at the results. I hope we’ll like them and start looking for other collections to add to the project. It’s taken a long time to get to this point, and we’ve barely started. Te Papa have been patiently waiting for us to get our act together and send them a list of their items that we use. (Ok, we’ve been slow, but competing priorities got in the way, but that’s finally settling down.) 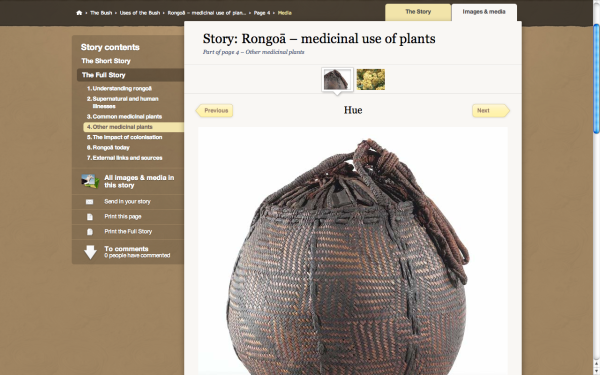 Here’s an example of one, a hue or calabash from Te Papa’s collection, used to illustrate Te Ara’s story on rongoā (the medicinal use of plants). 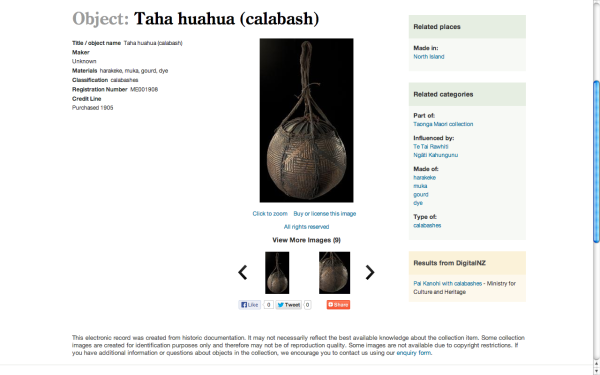 That calabash also appears on Te Papa’s site, and here users can see several photographs of the same object, all in far more detail. Taken together, what you’re getting is a rich visual experience of calabashes from Te Papa and the contextual information about how they’re used from Te Ara. Providing links between the two online uses of the same object could be really useful for users. Together they’re stronger than on their own. 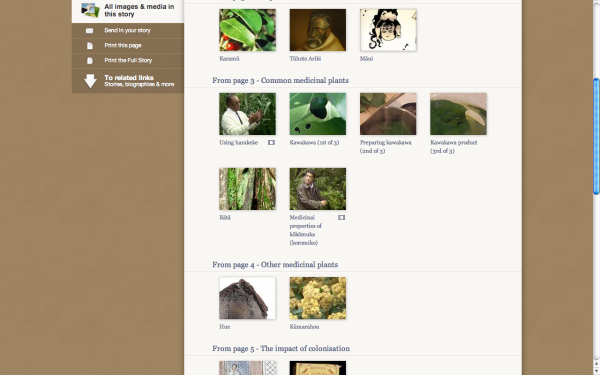 But wait, there’s more, thanks to the work Adrian and others have done in building Collections Online: they’ve got even more calabashes, in fact they have a whole taxonomic category for them. So now we can link from Te Ara to all the calabashes and back again. And where it might get more interesting is where we can help build relationships between different collections that feature in the same story; organisations can infer a relationship based on a subject. I hear you say this seems like a pretty simple idea. The web was kind of made for it. So why doesn’t this stuff happen more often? Competing priorities can always scupper simple ideas, and an idea like this that’s more about a shared good always takes second place to an organisation’s specific goals and work programme. They’re all valid questions, and we can answer some with commitments to things like persistent URLs. But we have to start somewhere and not let the questions get so big that they get in the way. At the core of this simple idea is a principle that’s worth following: the more we can collectively lead our users in and out of each others content and collections, the more use we’re providing them. Maybe individual links isn’t the best or most perfect way of doing it, but it demonstrates the value of doing something. From demonstrating the value, perhaps then we can move on to finding better glue to pull our content and collections together. Posted on September 5, 2013 by Matthew Oliver. This entry was posted in talking. Bookmark the permalink. I think this is a fabulous idea, and will add so much richness as well as showing the interconnectness between different institutions. I think at least having persistent urls will help (speaking for Te Ara here). 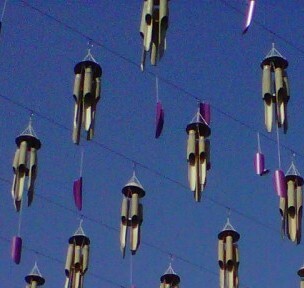 And some sort of persistent id for each object could surely be useful. My feeling is that the less hand-crafted these connections are, the more robust they will be.